Until May 3 I had never heard of Junior Seau. That morning, his girlfriend found him in the spare bedroom of his home near San Diego, a gunshot wound in his chest. There was no note. This was Wednesday, around the time we were driving from the Big Texan to the airport in Amarillo. Reading more, I learned he was a famous linebacker, nicknamed Junebug. Six foot three. Lots of friends. Probably seemed invinceable. During 20 years in the NFL Junior Seau sustained multiple concussions, none of which were diagnosed. The Chargers team chaplain said he never heard Junior complain about headaches, or other symptoms. "With Junior, that would be so outside of his nature because he had an amazing threshold for pain". Apparently, he was a fighter with a great attitude. Friends and family said they weren't aware of any recent issues that would cause him to kill himself. A neighbor was the only person Junior Seau told about his concussions and constant headaches. His family decided to let the autopsy include a brain study. No results yet. In the midst of this sad human story, I am encouraged by recent progress made by a team at the Boston University medical school. They studied the brains of veterans who had been exposed to bomb blasts in Iraq and Afghanistan. They also recreated bomb blasts in the lab to study the effects on mice. They found the same types of brain changes in the veterans, and in the mice, as had been previously found in professional athletes like Dave Duerson. They found abnormal proteins that indicate CTE, or chronic traumatic encephelopathy. When a soldier is near a single IED blast in a combat zone, his or her brain is affected in a similar way as an athlete who has spent his career taking hits in the NFL or NHL. That's what it means. The researchers emphasized that after the simulated blast, the mice in the study looked normal and healthy in every other way. If Junior Seau or these soldiers had confessed to having symptoms, if they had sought help, I wonder what the response would been. We are so visually oriented, as a society. If we can't see something, it does not exist. CTE is a condition that can only be diagnosed for sure in an autopsy. They have to cut open the skull and look at the brain of a dead person. This article does a good job describing what CTE symptoms look like in someone who is alive. So awareness is good, but is someone working on a better diagnostic tool? My dad kept a board game on the floor next to his desk in our living room. Once in a while he would pull it out with a grin, and try to get me and/or my brother to sit down with him. Maybe it was the two-dimensional, abstract nature of this game that didn't appeal. It's not really a kid's game. Or maybe I just wasn't that into football. Being female, I never had to go public with this heresy. In high school, as a sporty girl I did a few stints on the sidelines, running chains. The players were hitting each other hard, a lot harder than it seemed from the bleachers. Sweat (and sometimes blood) flew off their bodies when they hit, and this movie had a disturbing soundtrack too. It was not just the groans, or surprised "oof" sounds when players made contact and their lungs compressed. It was also the unmistakeable crack of helmets hitting each other. A medical provider told me forcefully that suing the NFL was unreasonable. He said the players undertook the risks themselves and they alone were liable. Thanks for volunteering that point of view! Would this have anything to do with your fear of litigation, when trying to help survivors of brain injury? Last week, someone in a position to help grant funds to SBI had a different strong reaction. This person just flat-out denied that my symptoms were caused by TBI. They were, like, normal forgetfulness. Wow, awkward! As you can imagine, the meeting with this football fan to discuss funding for SBI was over at that point. I went home feeling ashamed of my story. I don't mean to be unkind; imagine if your religion were under fire. You might lash out, too. But the danger comes when we allow religion to cloud our professional judgment. From a psychological perspective, these are interesting examples of defense mechanisms. The first, blaming the victim, is a textbook example of denial (by projection?). The second is a shining example of reaction formation, a Hail Mary to suppress the truth at all costs. I thought, what about football made these people so defensive? And then I thought, it IS attractive, isn't it. The image of ourselves as conscious, powerful agents. We have options in life; playing football (or riding in a car, or being attacked) is just one among many. We choose. We know we are likely to be permanently disabled at some point, but we fully and sagely accept the risk. Life is a game. Lots of people forget a water bottle when going through airport security. The fact that we forget something every time is not TBI, it's normal. No one is good at multitasking, no one is perfect. The cluster of TBI symptoms is probably temporary, it is because we are aging, we are human. No one is responsible. Back in the real world, why did these 2 people vent emotions to me? I am neither a football player nor a fan nor a lawyer. Because of my head injury, they might view me as vulnerable, unlikely to fight back. On some deeper level, they might feel guilty for participating. Perhaps they know they are complicit. The truth about head injuries has been known for a long time. Now the science is catching up, and the role of science is to make incontrovertible what we already knew. In blaming the survivors of TBI, we let our feelings knock us down. When the blaming stops, we can get back up and face the music. Now and then someone asks how this project came about. What's the connection between riding (half of) Route 66 and recovering from TBI? This project came from a pattern: after a hard aerobic workout, my thoughts were clearer. Voila! For a few days I could remember a thing or two! Of course these are just my observations. Post-TBI there have been daily examples of forgetting, remembering wrongly, or just spacing out. Even though memory is different than thinking, I've lost some trust in my own brain. The alternative, if the medical establishment was right, was to sit there and wait for my brain to get better. Then to give up after 6 months...and do what? Stagnate, retreat, lose my job and financial well-being, my relationships with friends and family? My plans for the future? I might have gone that route except long bike rides, endurance rides, helped whenever I did them. A hilly 100-mile ride typically bought me 2-3 days of clarity afterward. What's going on with the noggin? It might have something to do with blood flow. Dr. F. used the word perfusion, where the increased blood flow in your body transfers to your brain. Kind of makes sense. You probably get by now that there are lots of minuses to having a brain injury. We could go on and on... One plus to having a brain injury NOW is, lots of people are doing lots of research. On TBI. On memory and cognition. What helps with recovery and what doesn't. Someone at UCSF even developed a special MRI, one that sees subtle changes in the brain, like mine. With the vets coming back from Iraq and Afghanistan with brain injuries and the baby boomers getting older, we are taking a closer look at the brain. It's hopeful. Here's another example, an abstract of a study that shows executive function does improve during exercise. Also, regardless of age subjects could perform difficult tasks faster during exercise. Just the increased blood flow to the middle cerebral artery does not explain the better-faster benefits. They did find a connection though, between blood flow to the prefrontal cortex area of the brain during exercise and increased brain function. The benefit increased with exercise intensity. Hey, the prefrontal cortex is where short-term memory and attention live. It also happens to be the first part of my brain that bounced against my skull during the accident. If intense aerobic exercise clears my thinking and memory, if it makes me calmer and more able to focus, I believe that makes objective sense. The folks at SBI have helped me understand that recovery from TBI is not a linear exercise, but a multi-pronged effort. There are emotional, social, and just functional hurtles to overcome. For me, it all starts with a baseline of brain function. There's a dependency relationship; without exercise it's not possible to get my brain to work on anything. It's overwhelmed and can't get to the other hurtles. So this is the one we tackle first. Every time it stalls, we jumpstart it again. This project required cycling 22 out of 24 days. 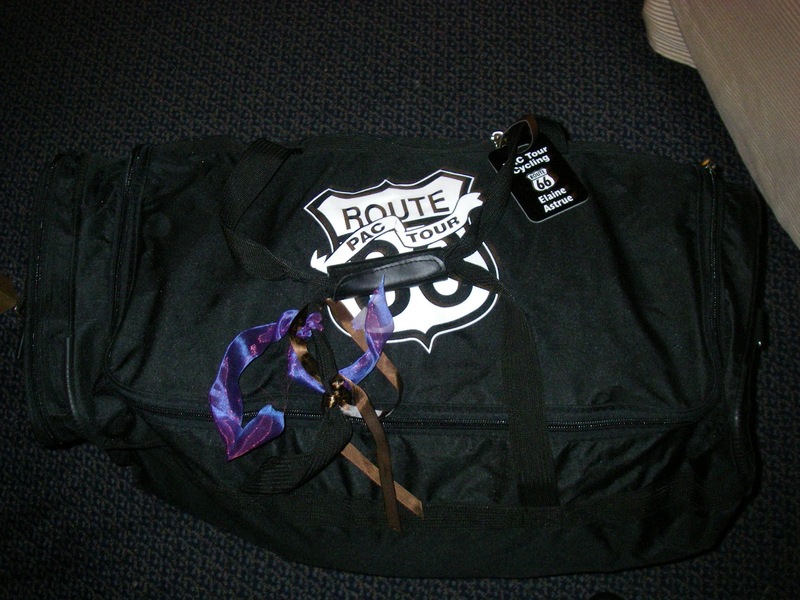 The Ruffy Tuffies hit the road every day except April 13 and 14; riding a bike was my job. Most days were 75-80 miles, with the longest day ~140 miles. As Danny points out, total April mileage was north of 2,000. Recently an SBI board member asked how I felt. I'm clear, my thinking is SO clear right now. I still forget a little more than I should, but it is great to be able to think in a straight line. Since the trip ended on May 2 I've ridden only a double century and a century. No other exercise, and I'm still clear! Of course, very tired too, feeling run down. At this exact moment, quite miserable with a flu type of bug. And feeling lucky to be able to do any of this for myself, at all. Our first evening together, Dan Rice asked the riders who had traveled Route 66 before to try to summarize Route 66, in a word or a phrase. No one could. Of course, Dan knew it was hard or impossible and this was definitely his point. Route 66 is not about one thing. The route itself has become an icon in popular culture, but a road is still just a way to get from one place to another. In Silicon Valley, we call that an "enabling technology ". It has no significance of its own. Any significance comes from what people choose to do with it. About halfway through the trip, Rudy decided to give it a shot anyway. For him, the Route 66 experience was the decline of rural America. So many people view Route 66 through the lens of nostalgia. And one thing I like about what he said is, it's anti-nostalgia. Anyone who has ridden a bike the entire width of Los Angeles can tell you that urban life in 2012 is pretty crazy. I don't know whether urban life or rural life is winning right now in America. Anyway, his observation seemed worth a quote. On a bicycle, the perspective of the rider is always facing one direction: forward. It's been quite helpful at times, to be forced to face forward. It's the direction of travel. To keep moving forward you learn to filter out everything else. When you dip into the past, it can get tricky. Route 66 took me back to an era I didn't experience, the era of my grandparents and parents. Traditional gender roles. No jobs for women. No laws against domestic violence. Segregation was legal. Cars lacked basic safety features, like seatbelts. Nuclear bombs (tested out here in the desert). Nuclear energy. The era of dams on rivers (like the Colorado). Simpler is not always better. Life was slower, no Internet. If you could live a slower, saner pace of life without the Internet, would you go for it? No? Yet with all the text and images about Route 66, the Internet is missing something. The heart of the experience is feeling the road under your feet. Push your quads up toward the Arizona Divide, coast down the hills. Sprint away from dogs in Laguna Pueblo. Slide around in sand on the abandoned tracks. Sneeze with the spring pollen, catch your shorts on barbed wire, wonder whether that is in fact a mesquite tree along a river bank. Fix a flat on the side of the road. Notice for the first time the red dirt of New Mexico. In some ways, on a bike tour, the greatest luxury of all is the glance backwards, the way that you've come. Amid the festivities, there was time for a few observations about Santa Fe and Route 66. We rented a Fiat 500 and headed north on I-25 from Albuquerque. About 10 miles from town there's a big hill and the Fiat shifted up and started to make a lot of engine noise. It goes on for a long time, the hill. Now I know that was the interstate version of La Bajada Hill, famous for scaring the bejeebers out of early travelers on Route 66. If we believe Google Maps, the old road connects Santo Domingo Pueblo to Santa Fe. From other riders I heard it is an almost-impossible climb, a steep dirt road with huge rocks. This was one reason not too many tears were shed when Route 66 bypassed Santa Fe in 1937. At the end of the Santa Fe Century, riders get on the interstate (I-25) and head west over the camel's hump into Santa Fe. Why not use Route 66 instead? Old Las Vegas Highway parallels the interstate the whole way.... We don't know why. Remember that on Route 66, the railway and trains kept us company almost the entire time. 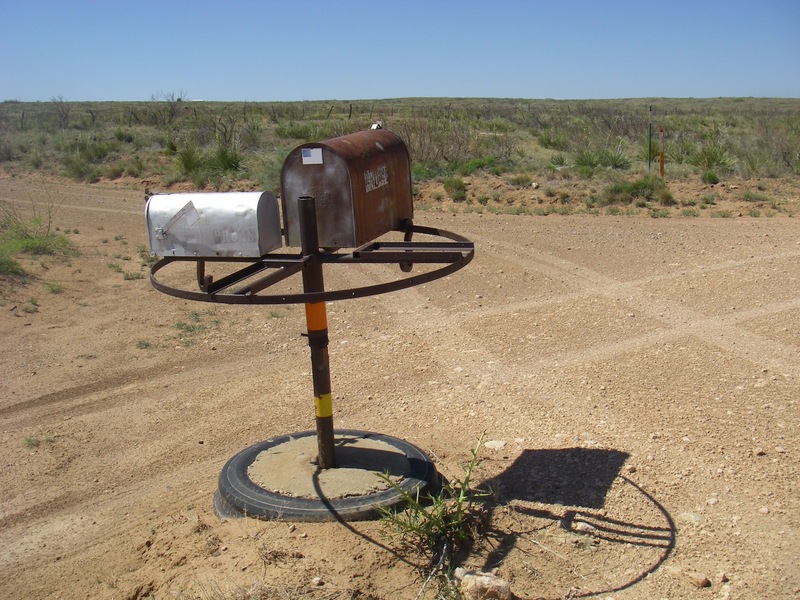 Route 66 leveraged the railroad right-of-ways. Albuquerque to Santa Rosa was the exception. Just the interstate and the ranchland, no trains. The camel's hump. So where is the railway in Santa Fe? Where is the station for the Atchison, Topeka, and the Santa Fe? The century helped us find it. On US Highway 285 we biked past a little green sign with a drawing of a train platform and a stick figure, pointing northwest toward Lamy, NM. Not Santa Fe! Why would the railway come to a tiny out-of-the-way place (and you can tell it's a tiny out-of-the-way place) like Lamy? The green sign that points toward the train depot is located at the bottom of a rather significant hill. The hills around Santa Fe, the railway folks didn't quite know what to do with them. 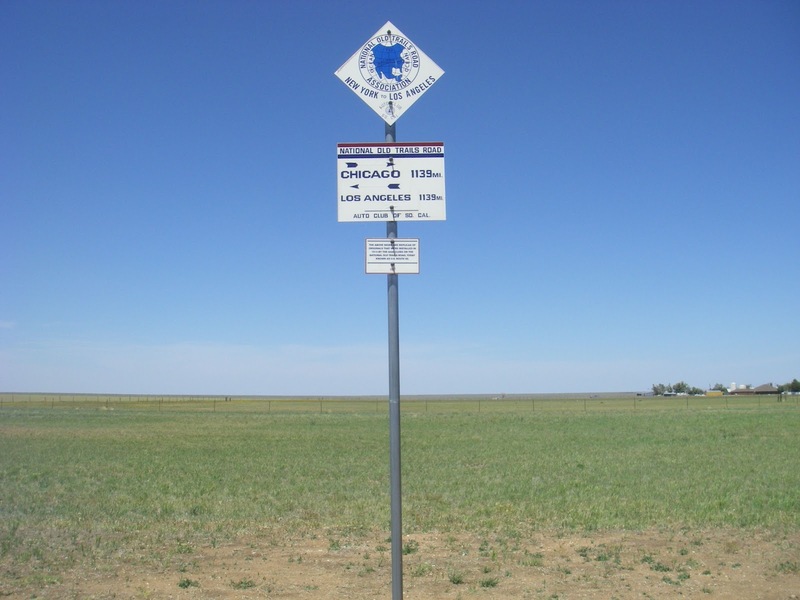 In 1880, a spur line was built from Lamy to Santa Fe. A tourist train and Amtrak buses now run from the Lamy station to Santa Fe Depot. Later, a line was built from ABQ to Santa Fe, and the New Mexico Rail Runner Express commuter trains run on these tracks, parallel to Interstate 25. Easier terrain. All of which hints at an interesting relationship between New Mexico's two population centers, Albuquerque and Santa Fe. Santa Fe, the older sibling, elegant and beautiful. Lot of history and a little too much ego. Albuquerque, younger, accessible, pragmatic. Poverty and low self-esteem. Even the airlines (and there is no geographical reason for this) fly only into Albuquerque. Neither can really make it without the other. Our dinner the last night was at Harry's Roadhouse, on Old Las Vegas Highway. Outside of town. Our 20-something waitress claims it used to be a gas station on Route 66. Danny had the ribs and I had the blue corn turkey enchildas. Really good. Definitely a notch above what we experienced on the Santa Rosa Cut-off. Route 66 came through Santa Fe for 11 years, from 1926 to 1937. The route it took is described here. We saw some vintage motels on Cerillos, like the King's Rest Court Inn. (Where we might have stayed on the trip!) Yet Santa Fe scored a spot on the north-south interstate, I-25. Santa Fe has been a destination for more than 400 years, and once established human habits tend to endure. We continue to detour, and Santa Fe continues to prosper. A mind-altering experience can occur anywhere. On a remote road in the middle of Monterey County, for example. In the suffocating dry heat somewhere in San Lucas Canyon, nothing is making sense. Why am I here? I never want to ride a bike again. I never want to SEE a bike again. What was I thinking, getting on a bike? I'm finished with double centuries, that's for sure. What was I thinking, I was trained for this? Both the hill and the heat seem to increase with each pedal stroke. I feel as small and powerless as I ever have my whole life. Maybe the organizers of this event were counting on a cooler day. Judging from the lack of ice and cans of V-8 thus far, they were expecting 90 degrees, not 100. The riders don't have that cooler day, we have today. One of those heat-spike days that turns out to be 10 degrees hotter than yesterday and tomorrow. This is the day we have to climb through the canyon, breathing only under the shade of oak trees and suffering on into Lockwood at mile 145. For me, physiology has a long reach, affecting thinking, feeling, acting. Those negative thoughts are like smoke signals from the brain. The content is not literally true, but their presence means something on its own. For me, I've learned these thoughts mean hyponatremia. As it swells, the brain sounds the alarm. By Lockwood my stomach has shut down for good, gone acidic. I can barely stand upright. All that good food from earlier just sits in my stomach, unable to digest. They are rationing out some V-8 but it's too little, too late. Can't get the medicine down. Can't swallow any more electrolyte pills either. My black shorts are tie-died with salt marks. Thanks to an identical experience 10 years ago on this ride, it's clear that continuing on the course is not an option. I won't finish. There are no stores out here to compensate for a lack of support. Persistent nausea is uncomfortable. Riding 70 miles without fuel is impossible. I'll have to get back with the glycogen that's in my legs right now and the clock is ticking. Time for Plan B.
Allan and Len are doing the Lowland Route, so I follow. It's only 200 miles, instead of 213 on the classic Highland Route. Less climbing, a faster finish. That's the ticket. Astonishingly, at Bradley I am able to consume a hot dog, one slow bite at a time. With mustard and relish. They have run out of soda (!) and one volunteer brushes with death when he calls me tired and cranky. I give myself a little silent award for not telling him, try Googling the symptoms of hyponatremia, Big Guy. Thanks to the humble dog and despite the volunteer, I limp in to finish the ride. Today is Thursday. 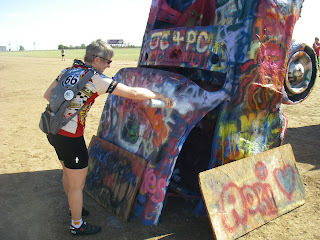 Yesterday my body started letting go of the excess water, five days after the ride. Yesterday my brain also started backing down from its assault on every dream or hope I ever had. I can think in a straight line again. And I'm thinking, balance is definitely underrated. Some people live by numbers; they log every mile ridden, every foot of elevation climbed. They store the data on a computer to show themselves and their friends, after the fact. Quantifying a ride enhances the ride experience for them. They quibble endlessly about deviations. I am not one of those people! At some point you might be looking for a bike route south. You can buy a book and follow the Pacific Coast Bicycle Route, yes. This route is similar, with optimizations for scenery and simplicity. If you are a numbers person, beware... the first 5 riding days were sans computer. These are estimates. Foothill Expwy to Cupertino. Cupertino to downtown Campbell to Los Gatos Creek Trail. Push the bike up the steepest part of the unpaved trail - it is possible to ride with smaller panniers. Alma Bridge, Aldercroft Heights, Old Santa Cruz Hwy to Summit Road. South to Corralitos. Into Watsonville, left on Lincoln, right on Riverside Dr., Left on Main south toward Elkhorn Slough. Right on Elkhorn, Right on Castroville, left on Castroville. Left on 156 for one exit over bridge. After exiting go left on overpass, then immediately right on Haro St. in Castroville. Becomes bike path to Monterey (follow signs). Lighthouse Ave, Pacific, Highway 1! Highway 1 to Morro Bay. Through downtown and the State Park to Turri Road. Los Osos Valley Road to Higuera to Tank Farm to 227. Corbett Canyon, Arroyo Grande (follow signs through town). Halcyon Road to Los Berros to Johnson Road. East on 166 for 3 miles, then Bull Canyon to Main Street out to Foxen Canyon. Important: two left turns are required to stay on Foxen Canyon Road. Phil sez do NOT go on the levee and do not attempt to traverse the dump! Ballard Canyon into Buellton. 246 east to Solvang. South on Alisal. Left on Old Coast Highway. With care, hop barriers to get on 101 South at the top of Gaviota Pass. In dry weather, consider Refugio instead (3.3 miles of rocky dirt climb). Hwy 101 to Hollister Ave. Cathedral Oaks to North Goleta bike route via N. Los Carneros Rd and Covington. State Street to pier. Left on E. Cabrillo Blvd, follow Pacific Coast Bicycle Route signs along surface streets. At Rincon Rd, get on Ventura Fwy. Exit at Pacific Coast Highway. Look for bike path signs in State Park, curve left to park entrance. Right on W Main Street. Right on S Olive, Left on Garden, Left on Harbor Blvd. In Oxnard, curve left onto Channel Islands Blvd. Right on Ventura Rd. Left on E. Port Hueneme Rd. Right on Naval Air Rd. At La Posas Rd, get on Pacific Coast Highway. At Will Rogers State Beach after Temescal Canyon, get on bike path along beach. The last day is not simple at all. It's impossible to memorize and I was worried about wrong turns! Key turns to remember: in Goleta, N. Los Carneros Rd., then Covington. In Oxnard, Channel Islands Blvd, Ventura Rd, Port Hueneme Rd. Other turns were signed. 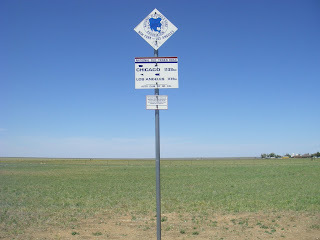 Detailed Route 66 cycling cue sheets were provided by PAC Tour. If there's enough interest they will offer an Eastern Half tour (Chicago to Amarillo) next year. A complete Route 66 map set is available here. You can also pick up an excellent guidebook at Dan Rice's shop on the Santa Monica pier. This morning at 9am someone started up a jackhammer a few houses down. Our neighbors have a ton of money for home improvement! It's a transition back to this life, for sure. The structure around the blog posts is shifting, too. Normally around 9am I would be fed, dressed, and one foot in the pedals. Or already out on the road with new friends. Taking photos, having adventures, making stuff to write about. It feels weird to be bike-free, to stay in one place all day. Danny, mystery companion. Every day for giving encouragement. Making sure my bike was ready. Tending Bella, sorting mail, and going to the office while I was gone. Supporting me via IM at the end of the day. Christine Camara of SBI, for accepting and supporting this crazy idea. Lisa and Henry and Pilar, working additional complexity into the SBI auction night! Dad, Mady, other family members, and randonneur friends for following the trip online. Jim Bradbury, blazing the trail. Rachel, for commenting! Mary and Eric Hamilton, for attending the auction (and buying a Route 66 jersey!). Veronica Beagan, for being a top-shelf, considerate roommate. Showing me the PAC Tour ropes. Giving up a dark room to fall asleep in while I posted text and photos. Having an irreverent sense of humor and good people instincts. Keeping track of breakfast and departure times! Lon Haldeman and Jim Hlavka, for putting up with our nonsense... And of course snacks along the way. Susan Notorangelo, for logistics and PayPal wrangling. You made it possible to do something new. Allan and Phil, for great company on the pre-ride. Team Awesome, for hilarity and inspiration. I am equally grateful for the safe landing (literally) and all the experiences out there on the road. Endings are sad and good, too. To escape the jackhammers and leaf blowers, I signed up for the Central Coast Double on Saturday. Day 19. Woke up at 6:30am and went back to sleep until 8:45! Woke up the second time to the loud droning of lawnmowers and leaf blowers. Bella gave me that look. It was a request to snuggle under the covers. Her request was of course granted. A part of me is still out there on Route 66, where there is no profession of lawn and garden care. People seem to live more in harmony with their surroundings. Yards are made up of dirt, scrub, sand, cacti and sometimes impromptu sculpture. Like rusted farm machinery or car parts. Perhaps some chain link fence. Even if it is about necessity and not choice, I feel more comfortable in that environment. It is what it is. 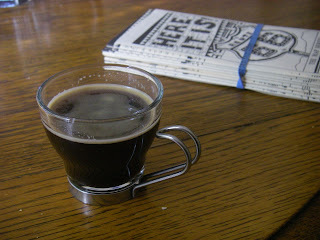 First order of business this morning was espresso. Danny fired up the Gaggia and drew me some of the essential brown liquid. 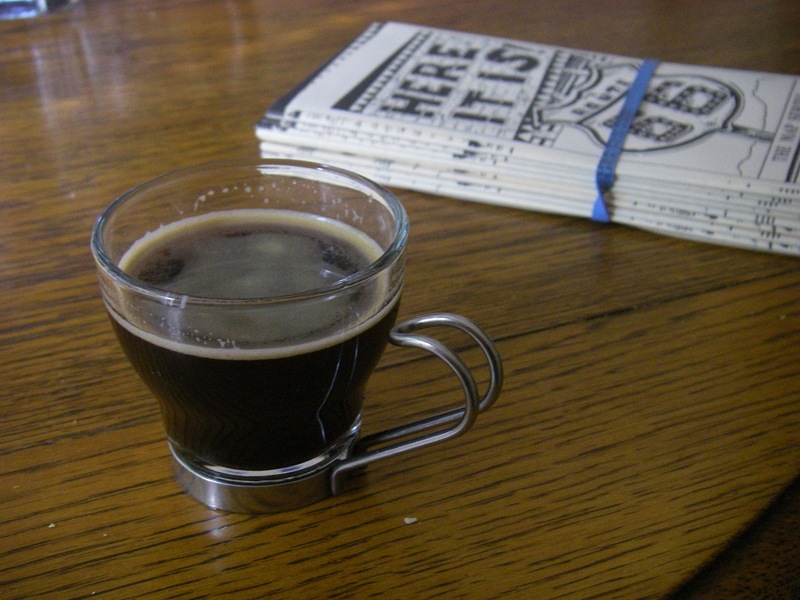 Half-caf, half-decaf doppio (with crema)! 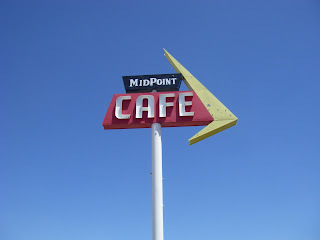 More later on the coffee of Route 66. Let's just say there have been a few improvements to coffee-making techniques since 1925. Yesterday our foray into 21st century aviation did not go as smoothly as it could have. Doug, Thea, and I all made it to the Amarillo airport in plenty of time for our flight to Las Vegas. We sailed through security (no queue) and took our spots on the plane at the appointed hour. Each of us was catching a connection to a different city: Seattle, Ontario, San Jose. The plane taxied onto the runway. Then came the announcement: trouble with the starter on one of the engines. We taxied back to the gate. Got off the plane. Over the next 6 hours followed a stream of announcements. Status on the problem (the starter had sheared off the engine altogether). ETA on the replacement part. Availability of vouchers. Estimated new departure time. Replacement tickets for connections. How to re-board the plane. There is something so simple about riding a bike. Assuming you can make a few basic kinds of repairs, it is true freedom. There were a few moments where I just felt like leaving the airport and riding home to California. They had the Waterford on the plane, so that was a problem. Also I could use a day off the bike. And that 25mph wind would be in my face instead of at my back. I stayed. Seven hours later we were headed to Las Vegas. Half the plane had been in the bar so there was lots of cheering on take-off. My seat directly over the affected engine meant no shortage of first-hand data. I could tell everything was OK.
After missing a replacement connection in Vegas, we finally landed on the runway at SJC at 9:10pm. Danny was waiting. Day 18. Veronica's alarm goes off at 6:30am. The to-do list is long even though today's ride is short. Breakfast at a little cafe in Vega; the locals are surprised to see us fill up the place. The pancakes are Texas-sized; they fill up a whole plate. We make lots of jokes when Gerd, who is physically the thinnest, orders two. The jokes run toward the 72 oz. steak contest at the Big Texan. At the motel this morning Veronica discovers a flat and so does Susan R. No rest for the flat-fixers! At least there's not much risk of being left behind. We mosey on down the road, wind still at our backs. Maybe we are sorry to see the trip end. Or maybe the legs need a rest day... after 18 straight days of riding. 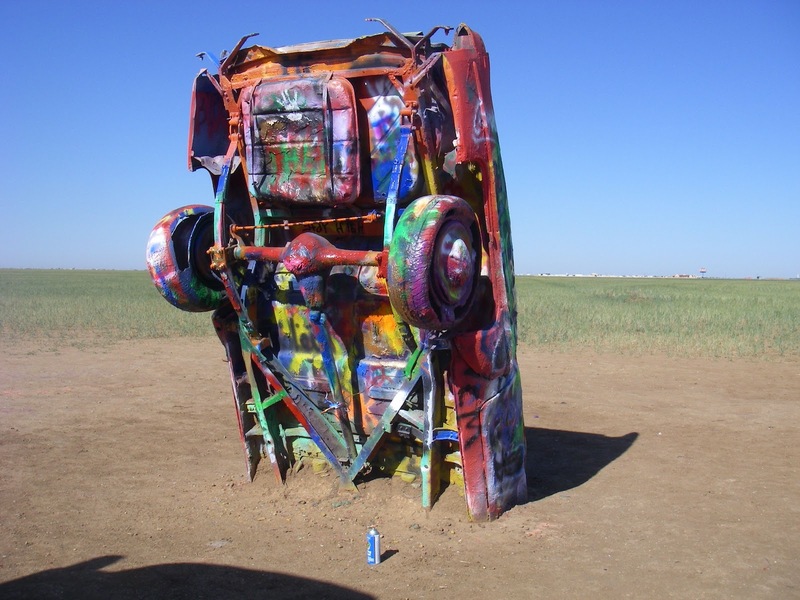 The van parks at Cadillac Ranch. We're expected to stop, we have to stop, but if I were by myself I would just ride on. Sometimes it feels like too much structure, to be directed to look at something. Like we're on a tour bus, but have to pedal. Worst of both worlds, right? 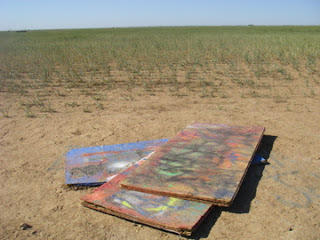 Cadillac Ranch turns out to be one of the coolest places we've seen. Cars stuck at an angle in a field. The paint looks recent. Paint cans are lying around. Are we meant to use the paint on the cars? We can do that! Elaine works on her graffiti skills. Thea hands me a paint can. I don't know what to paint. Then, it comes to me: route66ajourney. Paint that. Unfortunately I'm better with a bike than a paint can. You just have to trust that's what's written in white on that there Cadillac. 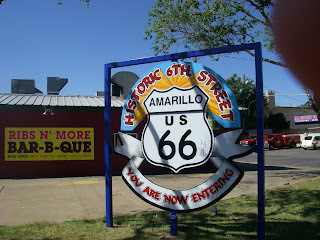 It's a fast roll into Amarillo. 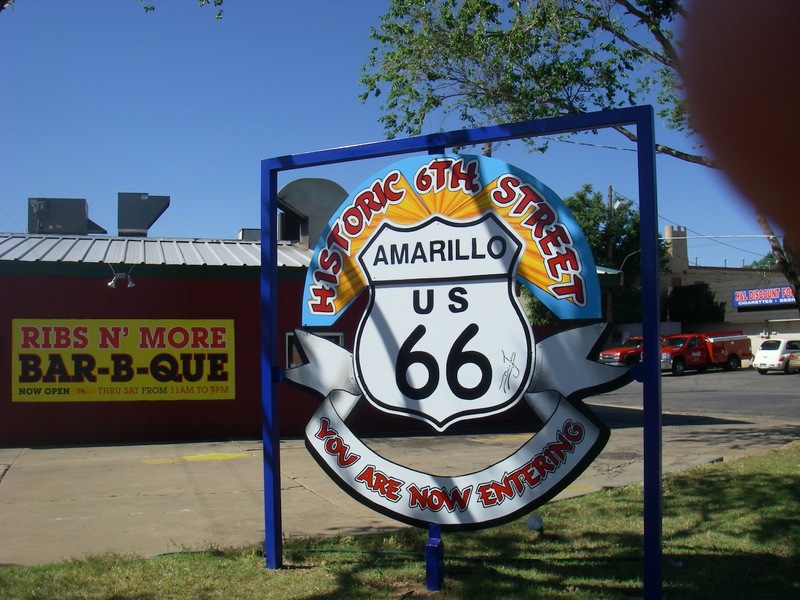 Did you know Amarillo was a hip town? That was another one of today's discoveries. There seems to be some kind of urban renewal going on, some of it focused on Route 66. For example, 6th Street has some cool antique shops. The kind where you might find something, not the tourist kind. It's time to pay a visit to a local artisan, one agent of renewal. Krystal of ReMain Designs has invited Thea, Susan R. and me to tour her new studio downtown. It's only a half a block off Route 66. We spend a fascinating hour talking with her. One of the things we hear about is how artists and other folks in Amarillo are working to create a vibrant, creative urban environment. Krystal creates useful items out of old bike parts and other discarded bits of metal. Her ethic is to use what's here and available, rather than throwing away and buying new. To me this feels similar to what brain injury survivors have to do in order to redesign their lives. Will post more on this visit soon. Until then, these photos give a feeling for her work. It's been a powerful, exhausting day. We're here at the Big Texan with zero miles to ride. No more hills, no more tailwinds or headwinds. It's all done. The Waterford is in a box. People are flying home. Thanks for following the ride! Check back for more posts about the trip and recovery from brain injury. I'm going to go brush my teeth, wake up tomorrow and try to get all this stuff back to California. Day 17. 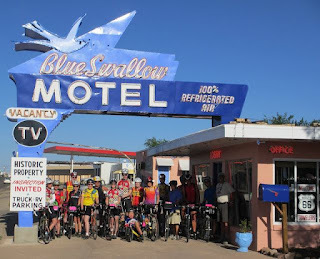 After breakfast at the Kix 66 Cafe in Tucumcari and after one last group photo, we head east again toward the Texas state line. 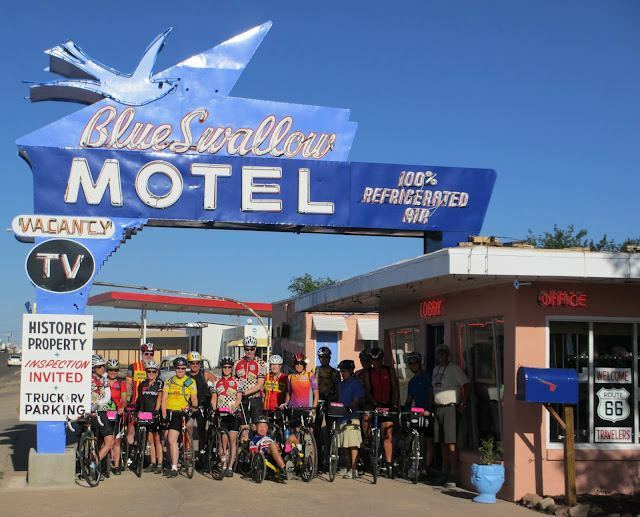 It's sad to leave the Blue Swallow Motel but Amarillo is calling. Everyone can feel the end of the ride is near. I haven't been writing much about the cycling challenges because they are scarce. Since Grants the wind has blown strongly from west to east. We've had plenty of help crossing New Mexico. Our first stop this morning was a ranch 14 miles east of Tucumcari. The rancher started a folk art project involving shoes. All his fenceposts seem to have a shoe fastened on top. They're his old shoes and our best guess is they represent kicks on Route 66. We're here to help attach a new batch of shoes. It's a welcome respite from the rigorous work of harnessing a tailwind. 10 miles down the road we cluster once again around the van for cookies, bananas, and Gatorade. To the south along a low ridge wind turbines are visible. There was a huge one right in Tucumcari as well. Looking around at this flat land that goes on forever, you start to wonder - how do people live out here? What is the economy based on? The last few generations the economic mainstay has been cattle ranching, and of course traffic from the railroad and Route 66. As one Tucumcarian said yesterday, it just doesn't rain here. There's a drought going on but even so. Without rain it's tough to farm. I don't know much about wind power, but wind seems to be abundant here in eastern New Mexico. Lucky us! According to a couple of cyclists who have done this route before, in 2009 the wind blew the other direction, in their faces. In that case today would have been an entirely different experience. To generate wind power, there's no need to be as lucky as we are, for the wind to blow in exactly the right direction. The turbine adjusts. As the morning spins on, it becomes clearer that the theme of today's ride is ghost towns. 4 of them: Cedar Hill (near the shoe ranch), San Jon, Glen Rio, Bard. The road narrows from four lanes through San Jon to two. Then a car up ahead has the telltale plume of dust coming from its wheels. More dirt. Veronica is looking at her rear tire by the roadside. A moment later she rides up alongside and reports that her rear tire has a bulge in the tread. I can hear it thumping a rhythm as the wheel spins. My instinct is to get far away from that tire! 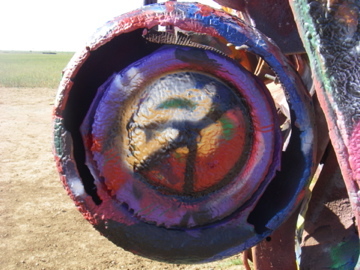 A bulge like that is a terminal condition that can cause a blowout. She heads for the interstate, conveniently located just to our left. Her odds are better on pavement. Lon warned us this morning that the condition of the dirt route is variable, depending on the year. Sometimes it has deep sand just like a beach. Sometimes it is completely rideable. We're going to find out... Hans, Vic, Thea, and I head east. I'm certain we will find sand and plenty of it. It's been a very dry year. The light-colored stuff is the old roadbed. As we ride mile after mile, I get more cautious, waiting for the killer sand. Mile after mile requires strategy and watchfulness, but so far so good. 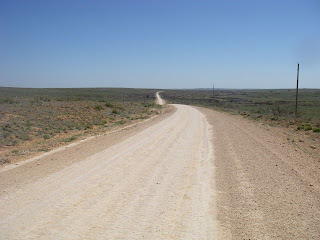 Long miles of graded roadbed with some gravel. The cars that travel this road today go a long way to making it rideable on a bike. The tires clear sand and gravel in their wake. When the surface gets worse, I just switch left or right to the other tire track. Just after the ghost town of Bard a handmade sign says "Access to I-40 5 miles". Glen Rio, another ghost town, is on the other side. There's cattle ranches out here, but not that much traffic between the two these days. With my rear tire fishtailing around, it becomes more challenging to stay upright. Still doable, though. I can see the fishtail tracks of Hans, Vic, and Thea in the sand. The van is waiting in old Glen Rio. Veronica has just pulled up, so we don't have to send the posse. Her tire lasted for all but the last 3 miles, when it picked up one of those friendly wires and went flat. She hitched a ride to the van and is busy putting on a different tire. Some say Glen Rio is already in Texas. 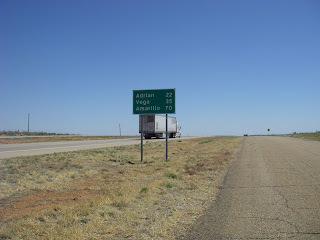 But it seems like we cross into Texas one half-mile down the road. The big difference is, it's flatter and there's no barbed wire to negotiate when crossing over from a frontage road. At the state line. Route 66 on the right, I-40 on the left. The wind is still our friend, pushing us quickly to the MidPoint Cafe. We have come 1139 miles since leaving Santa Monica. Time for lunch! 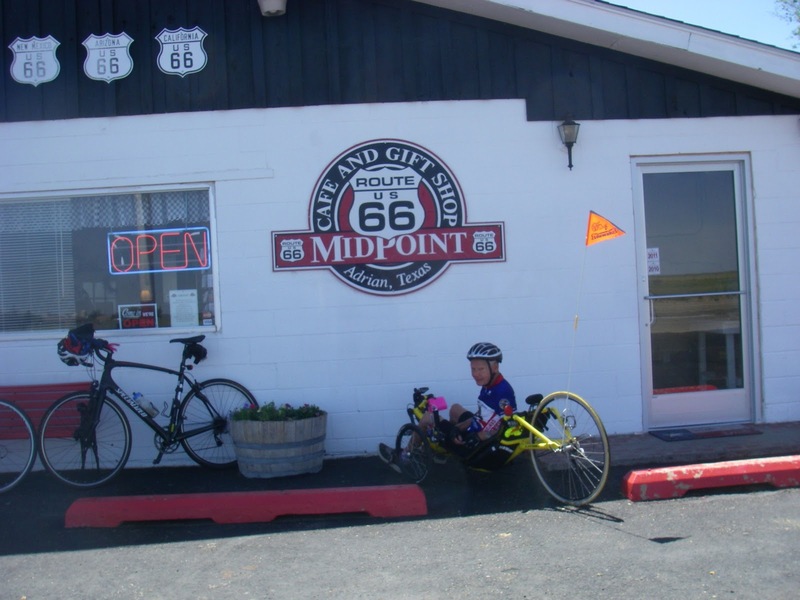 Gerd on a good day for the recumbent trike. 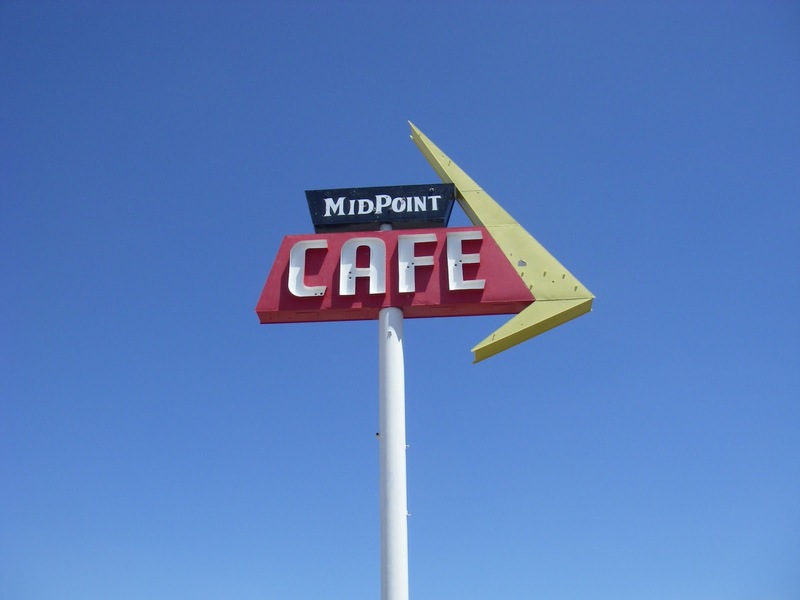 Replicas of the original midpoint signs. Adrian, TX where the cafe is located, is a bit of a ghost town itself. The semis roar by happily on the interstate, destinations unknown.